Q. How are the sensations so far on the grass courts? RAFAEL NADAL: Good. I am trying to practice as much as I can since I arrived here. And always is a nice feeling play on grass, a surface that I really like to play. No, without playing tournament before here always is a little bit tougher, because is easier to adjust your game on the competition because you really play with the real feelings than when you are only practicing. But we'll see. I hope to be fit and ready for Monday. Q. How would you describe the talent that is in your half of the draw? RAFAEL NADAL: No, is what there is. The rankings say that these kind of things can happen. So I know you are talking about Andy and Roger probably, but I don't see them before quarterfinals and semifinals. So I have a long way to work before that. I didn't play a lot on grass last couple of years, so I really take care about myself and about the first round. I don't think about the other things, no? My view is if I arrive to quarterfinals is because I will be ready. Then you can win, you can lose. But for me, going to be very tough to be there. I gonna try. Q. Do you think the fifth seed is fair? 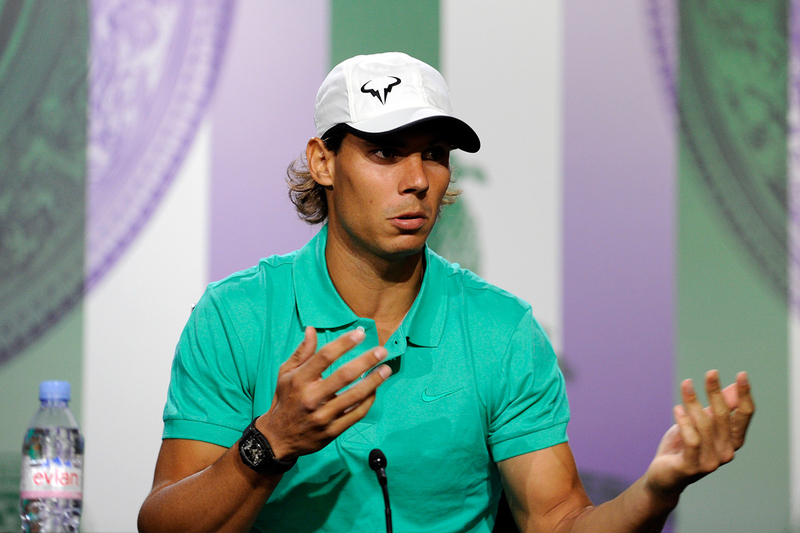 RAFAEL NADAL: I am No.5 in the world today, so the rankings say is a longer discussion. Is the way that the ranking is doing. Is completely fair that I am No.5. I am No.5 and David is No.4. He win his privilege to be No.4 before me, and that's it. Q. Because the transition from clay to grass is so fast, would you like to see the grass court season a little bit longer so you could maybe get a tournament in? RAFAEL NADAL: I know that's something that gonna change I think in a few years, two years. So in two years we going to have the new calendar with three weeks before Wimbledon. Is something I think is great, because in the end, the players who will play Roland Garros until the last few days will have little bit better chance of prepare well for a very, very important tournament like Wimbledon. Is something that today few players were able to do in the last couple of times, have the chance to play very well in the French and have the chance to be ready for Wimbledon. But is something that is normal to happen when you have very long and hard clay court season. You finish Roland Garros always with some problems, physical. You get little bit tired. Sometimes is not hundred percent fair that you cannot prepare well one of the most important tournaments of the year like Wimbledon. So I think is a great thing. Q. You've played nine tournaments already this year and made it to the finals of all nine. You've played a whole lot of tennis, more than usual, coming into this part of the schedule. Wondering how you're holding up and if you expect to play a full second half of the year. RAFAEL NADAL: I go day to day. Is not time to analyze what's going to happen the second part of the year. Since I start from today, I was able to play all the tournaments that I wanted to play. That's the best news possible. Before I came back, I take this year like a transition year, so is obviously that the situation change. I will compete here as good as possible. I gonna try my best, and then we will see. Then we will see what's next for me. I really don't have completely decide my schedule after here, because I have to analyze little bit more what's more or less favorable for my future. And at the end, the only thing for me is be healthy and have the chance to compete well and healthy when I want to compete. The rest of the things are important, yes, but less important than be healthy and have the chance to compete well. Because at this point of my career, the most important thing is be happy for me. And I happy when I have the chance to compete well. Q. What can you tell me about Steve Darcis, your first‑round opponent? RAFAEL NADAL: He's a good, talented player. He knows how to play tennis in all the surfaces. He has good shots. I say he is a complete player. I have to play well. I have to play very competitive from the beginning. Here, in these kind of surfaces, well, in this surface, on grass, all the matches are close. Matches can be decided for a few balls. So if you are not hundred percent focused and you're not at your hundred percent of energy and playing well, you are in big trouble. Q. When you look back at your exit in the second round last year, is there anything you can learn from that experience or is it something you should try to forget? RAFAEL NADAL: No. That's tennis and that's the sport. That's the good thing about the sport: sometimes you lose, sometimes you win. Last year I played here because is a tournament that I love, but I was not ready to play here. That's the real thing. I play with an infiltration from the first day. After Roland Garros I feel that my knee was not there anymore. The example is after here I was not able to complete in not one more tournament during the rest of the season. I try my best. I don't have nothing to learn about that year because is not an excuse. Rosol played a fantastic fifth set. He probably beat me if I was healthy. Is not because I am healthy I gonna play better this year, no? That's tennis and that's the sport. You lose, you win. That's part of the game. But that experience for me last year was too much. I suffer too much. If you are in the final rounds and if you have to protect or play with an infiltration, it's fine. But playing with an infiltration from the first day doesn't exist. Was Wimbledon, so was not a good decision for me. Q. What's the most difficult thing for you when you move from clay to grass, how that changes the game? Has that shift gotten easier for you now than it was maybe earlier in your career? RAFAEL NADAL: No. I never had a big problems on that. You have to play in a different way. You have to prepare mentally for another things than what you are prepared mentally for when you are playing on clay, for example. You have to be hundred percent ready to be playing focused in every moment, especially with your serve, because you lose your serve and you are in a big problem for the set. And then you have to accept that you will hit very bad shots because that's part of the surface. You will probably be on court for half an hour, will not have a chance to hit many balls. You have to be patient and accept all the situations that will be happening during the match. But at the end, are playing in a fantastic tournament in a surface that I think is very nice to play, even if sometimes can be frustrating. You play against a player who is serving great. But I think this transition in the end is great because is something completely different. You try different things. You play different ways. So that's makes the things little bit interesting and more funny. Q. Serena Williams talked about her early defeat at Roland Garros last year as a key motivation factor for the amazing run she's gone on since. Do you ever find the same thing when you suffer losses against players you are expected to beat? RAFAEL NADAL: No. My motivation was always high. That's the real thing. When I lose is because I don't have more. But my focus and my passion for the game, there is no doubt that I was trying my best in every tournament, in every single tournament I played. If is a Grand Slam or is a 250 tournament, no, I try to play all the matches of my year with the same intensity, no? Then when you are coming back from a situation that I came after injury seven months, it's true that you came with a special feeling, very fresh, special motivation, because you feel that you lost a year for things that you cannot control. That really motivates me. But a lose, nothing special. Just accept that that's the sport. You lose and you win. That's the great thing about the sport in general. Q. After the intensity of the French, the mental and physical exertion, do you give yourself a few days after to put the racquets down and forget about tennis in Mallorca? 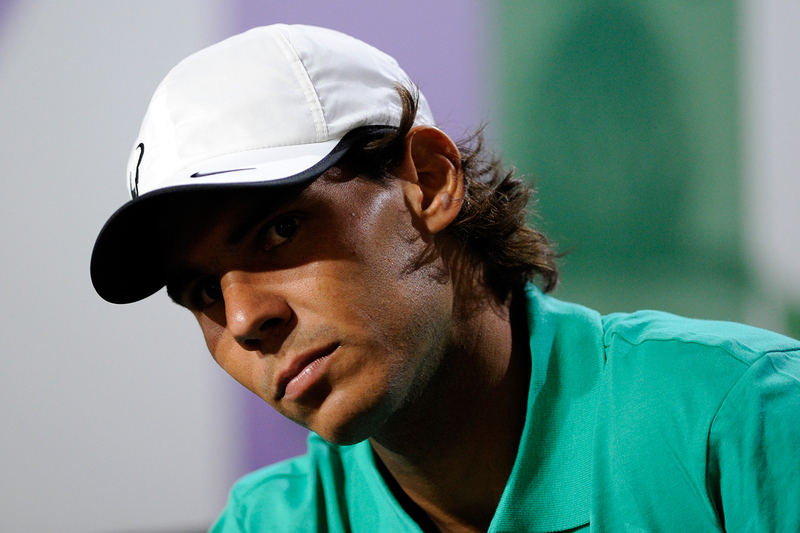 RAFAEL NADAL: You cannot forget the tennis when you have Wimbledon in two weeks. It's impossible. But, yes, I stop for a few days. On Tuesday, Wednesday I worked after Roland Garros. I work the physical performance every day. I didn't play tennis‑‑ first day I play tennis is Saturday. Sunday I play a little bit. I arrive here Tuesday morning. Tuesday I was practicing here. The rest of the days I was able to enjoy a little bit the island in Mallorca with friends and family. Was great, because this part of the season the weather there is great and we have the chance to enjoy the sea.